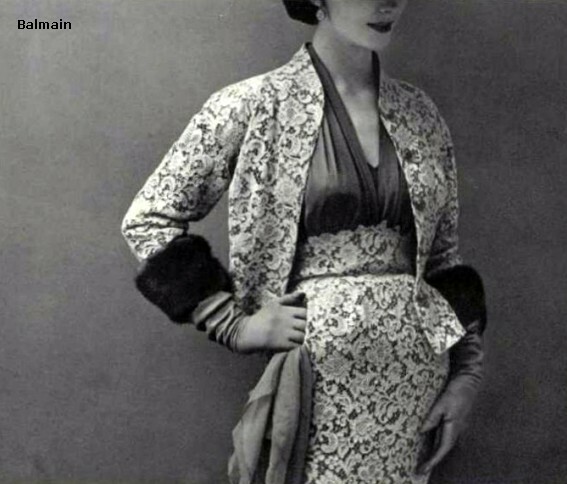 This lovely lace suit was inspired by a 1952 Pierre Balmain design. 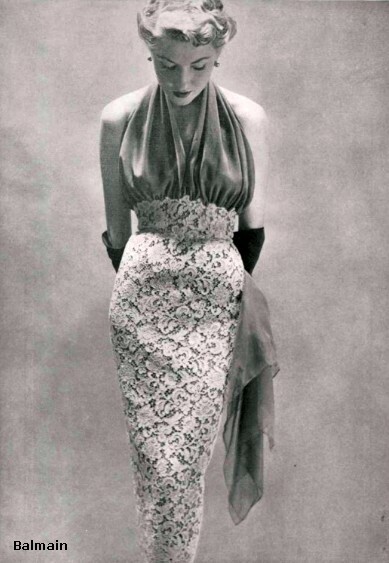 I'm a huge fan of Balmain's 1950's fashions and fell in love with this lace and chiffon halter sheath the moment I saw it. Things got even more exciting when I saw the sheath with this jacket. So of course I made a whole bunch of suits. I started out making the suit in rose lace. But I couldn't be satisfied with just lace, I loved this design so much that I wanted to see what it would look like in brocade. The suits lead to making a full skirted halter dress in cotton print, and chiffon. Lace and silk chiffon in rose. I love my new Palm Springs Gene. My Palm Springs Madra is lovely in cream. Which brought me back to the halter sheath in sequins. I wish I had made this dress shorter for Violet, so I just tucked up the bottom of the dress. What a beauty my Palm Springs Violet is! This was a lovely journey from one gorgeous dress to another, great work :-)!